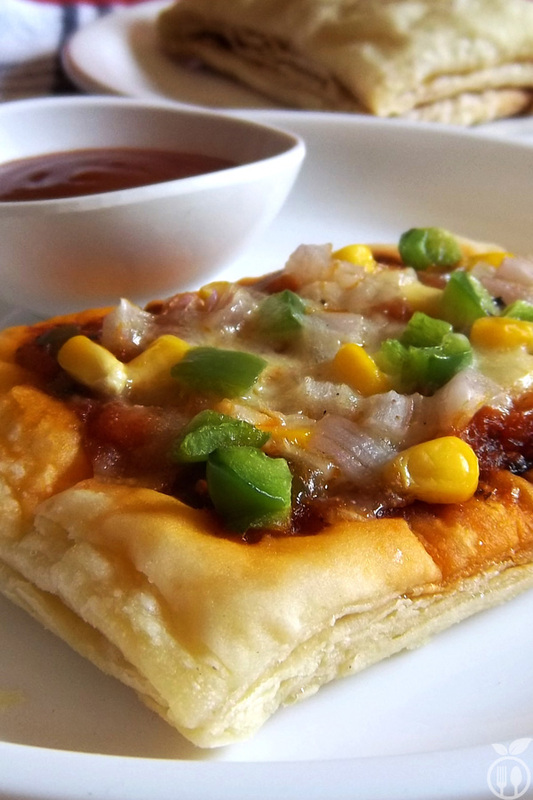 Veg Pizza Puff Recipe is one of the favorite pizza puff pastry recipe among the vegetarians. 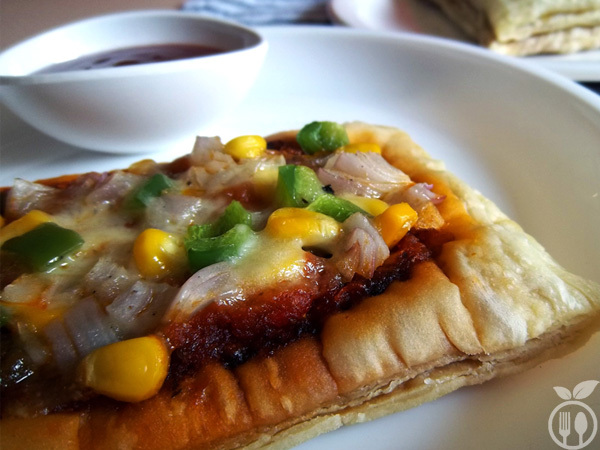 Vegetarian pizza puffs are large rectangular puffed pizza, topped with onion, capsicum, peppers and lot of cheese. 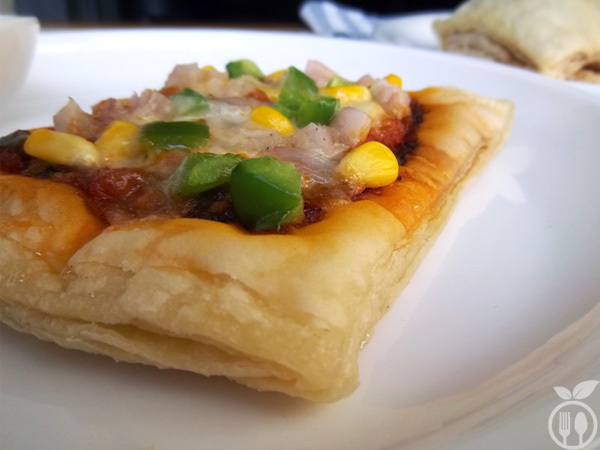 Made with a puff pastry base and a perfect food for snacks. Friends, this fusion recipe come out really awesome innovation while making puff. Making puff is little difficult, I know, but from homemade pizza to homemade pizza puff, that is very nice fusion I have ever found. PUFF!!! This is my favourite Dish. During my college life; my only survivor food for lunch was Puff. 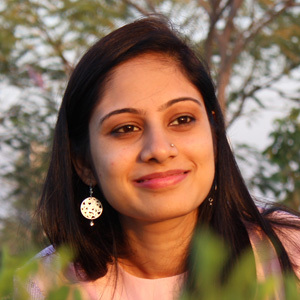 It was my best friend always there for me when I went to canteen for food. But unfortunately, I can’t find good puff in my city currently I live in. Since 3 years, I am searching for good puff in city, but what I found is Puff pastry dough!!! I was glad at least I can make puff for me as I wanna make. Puff pastry will raise and have most beautiful crunchy layers… I need to put stuffing on top of puff pastry. So first I half cook pizza sauce to give little twist on Pizza recipe. Then I also half cook the puff pastry, and finally combine them and I got Blast!!! When my husband took a bite from it, he told me “This is delicious, keep doing this type of stuff, I am more appetite…!” You please try this; it is really amazing recipe from my Thought-Book. In a pan, heat oil, and add garlic. Cook it for 1 minute, add tomato puree. Sauce is ready to use. Place the puff pastry dough onto a baking sheet. Bake for 10 minutes. Remove from oven and use a spatula or spoon to push down the centre of the crust, leaving about a 1-inch margin on all sides. In puff spread pizza sauce, leaving about 1 inch of margin from all the sides, top with cheese, onion, green pepper, fresh corn kernels. Serve with tomato catch ketchup. Can you please suggest puff pastry used for the recipe. Hay Pooja, I made puff pastry at home. But you can use readymade puff pastry available in market.